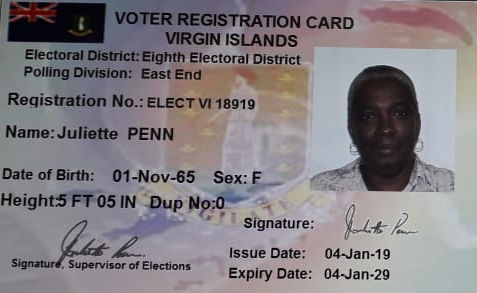 Voters in the Virgin Islands will, for the first time, be able to use voter registration cards in the 2019 General Elections. Supervisor of Elections, Ms. Juliette Penn, said this is made possible by the Elections (Voter Registration Cards) Order, 2018. The Order which was signed by Acting Governor, Mrs. Rosalie Adams, OBE on December 31, 2018 and gazetted on January 3, 2019 grants authorisation for the use of voter registration cards. According to the Order, the Voter Registration Card shall be used solely for purposes of ascertaining the identity of the holder and will be used as a Government issued form of identification. The cards will be issued free of charge and will be valid for a period of ten (10) years from the date of issue. Ms. Penn stated that the Office of the Supervisor of Elections has already commenced the process of taking photographs of registered voters and will commence issuing cards in the coming weeks. The Supervisor of Elections is urging all registered voters to visit the Office of the Supervisor of Elections to have their photos taken when the district schedule is issued. For the upcoming General Elections, voters will be expected to present a Voter Registration Card or other Government issued identification. For more information, please contact the Office of the Supervisor of Elections at (284) 468-4380 or 468-3701 ext. 4380 between the hours of 8:30 a.m. and 4:30 p.m. Persons may also visit the office located on the ground floor of the Ulric Dawson’s Building #6 in Road Town.